At the time of writing this post I’ve been on the ketogenic diet for over five years and logged over 250 blood ketone tests in an effort to estimate the effects of food and ingredients on my ketosis, including those in protein bars like Costo’s Kirkland Signature brand. I think ketogenic dieters naturally gravitate towards protein bars looking for a convenient sweet treat that won’t kick them out of ketosis, but are protein bars the right place to look? 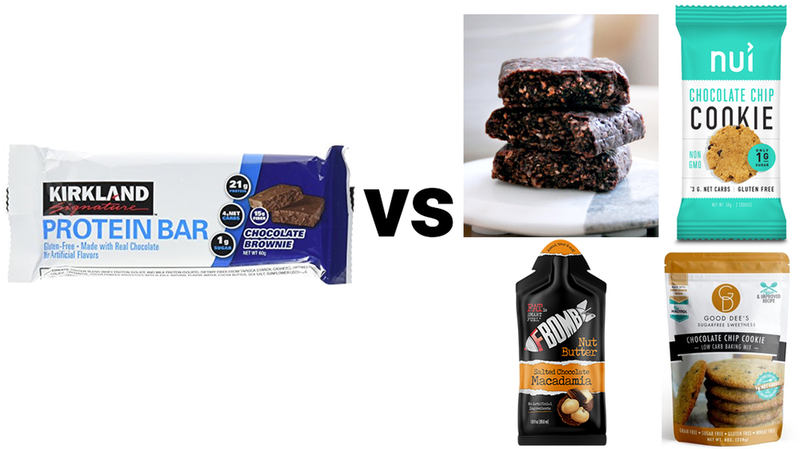 In this post, I’ll evaluate Costco’s Kirkland Signature protein bars, give them keto friendly grades, and see how they stack up to other low carb treats! Overall factors: +1-2 hidden net carbohydrate estimate from the 15g of tapioca fiber which we don't know how much it affects blood glucose. Also low nutritional density and very easy to overeat factored into grades. Costco’s Kirkland Signature protein bars have a lot going for them. I like their taste, chewy texture, and they have quality ingredients like unsweetened chocolate, cashews, Erythritol, sunflower lecithin instead of soy lecithin, and stevia. As you can see, when comparing Kirkland Signature protein bars to the best keto-friendly treats out there by net carbs per 100 calories, which is the most consistent indicator of keto friendliness, Kirkland bars are just not at the same level, and this chart doesn't include the hidden net carbs in tapioca fiber. So in conclusion I recommend going with more keto friendly sweet treats like ChocoPerfection, Nui cookies, Keto Bars, and F-Bomb pouches. My personal favorite is ChocoPerfection, it gets an A- keto friendly grade and an A+ in taste from me. Are Quest Bars Ketogenic Friendly?